It is well-known that stock returns do not follow the normal distribution that is commonly used to analyze returns. Less well known is that the returns from one year to the next are not independent; there are small correlations. A consequence of these correlations is that the riskiness of stocks grows slower than simple models predict. Jeremy Siegel made this observation in his book Stocks for the Long Run. I found this result so remarkable that I decided to investigate myself. I grabbed Robert Shiller’s historical U.S. stock returns and made some calculations. Over the past 100 years, U.S. stock market returns have had a standard deviation of 19.0%. If the returns of each year were independent of each other, we’d expect this standard deviation to grow by the square root of the number of years. So, after 25 years, we expect the standard deviation of total returns to be 5 times higher, or 95%*. For each time period from 1 to 40 years, I calculated the standard deviation of stock returns from 100 rolling periods** ending from 1914 to 2013. 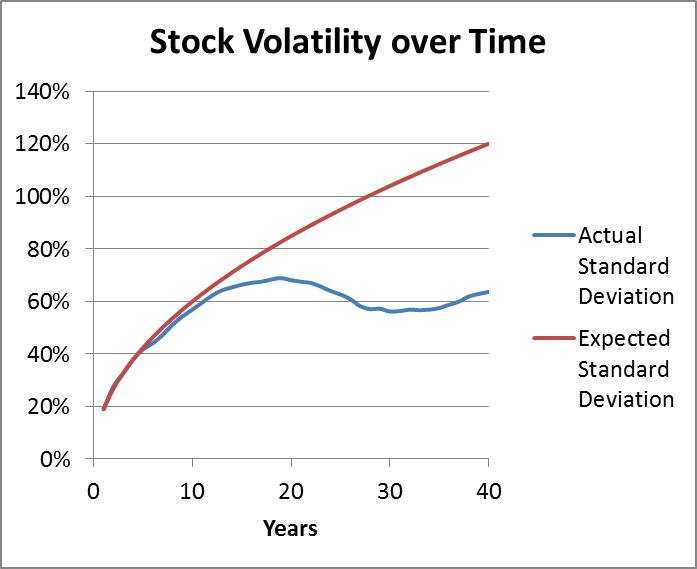 The following chart shows the results of how actual stock return volatility changes over time compared to the expected values based on the simple but flawed model. It’s hard to see in the chart, but for two-year periods, the volatility is actually slightly higher than expected. This is consistent with a small momentum effect. A good year in stocks increases the odds slightly that the next year will be good as well. However, we get the opposite effect over longer periods. A good decade increases the odds slightly that the next decade will be below average. These correlations are too small to use for market timing, but they can be useful for long-term investors. For those who have been able to stomach short-term fluctuations, long-term returns have been far less uncertain than simple models predict. None of this is much use for investors who limit the volatility of their portfolios for peace of mind and so they don’t sell in a panic. But for investors who ignore short-term fluctuations, history teaches that total returns over decades aren’t as wildly uncertain as we might fear. * A technicality here is that we are treating returns as following a lognormal, distribution. To calculate standard deviation, we don’t use the return r for each year, but we use ln(1+r). This means that even if the log of the return is a large negative number, the actual return is never less than -100%. ** Because I used rolling periods, I had to adjust the standard deviations upward to compensate for bias. Statisticians are used to adjusting the volatility of a sample up by a factor of n/(n-1) to remove bias. With rolling periods, the adjustment is more complex. With rolling periods of m years and n rolling samples (n=100 in this case), to remove bias we increase volatility by a factor of 1/(1-m/n+(m-1)(m+1)/(3nn)) when m<n, and by a factor of 3nn/((n-1)(n+1)), when m is greater than or equal to n.